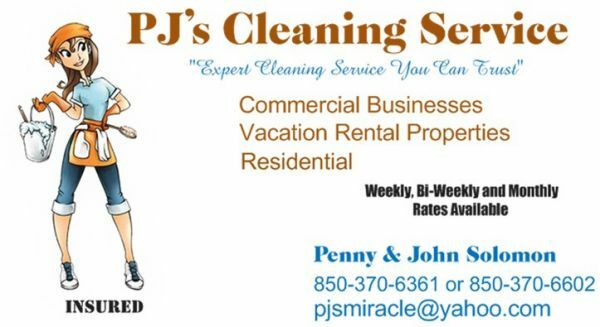 Commercial cleaning, business offices, listed properties, new construction and vacation rental home cleaning. Call for a quote! Vacation Property Management. Maintenance Checks: We provide weekly/ Bi-Weekly / Monthly maintenance check for owners. The following is list of items we check. Changing air conditioner filters; turn on faucets and check for leak under cabinets; check windows and doors to make sure they're still locked and nothing has been broken. We also provide owners with update on their property after a storms. Weekly $35.00; Bi-weekly $60.00; Monthly $100.00 Most employees or either retired law enforcement or officers working part time. When there's a question about your home we're just a phone call away so you rest easier about your home away from home. Property Management - If you have VRBO or Airbnb properties we can mange the cleaning, and bookings for you.